Two real estate agents are set to launch a central repository for unlisted for-sale properties, marking the latest attempt to capitalize on tendencies to market homes off the multiple listing service (MLS). 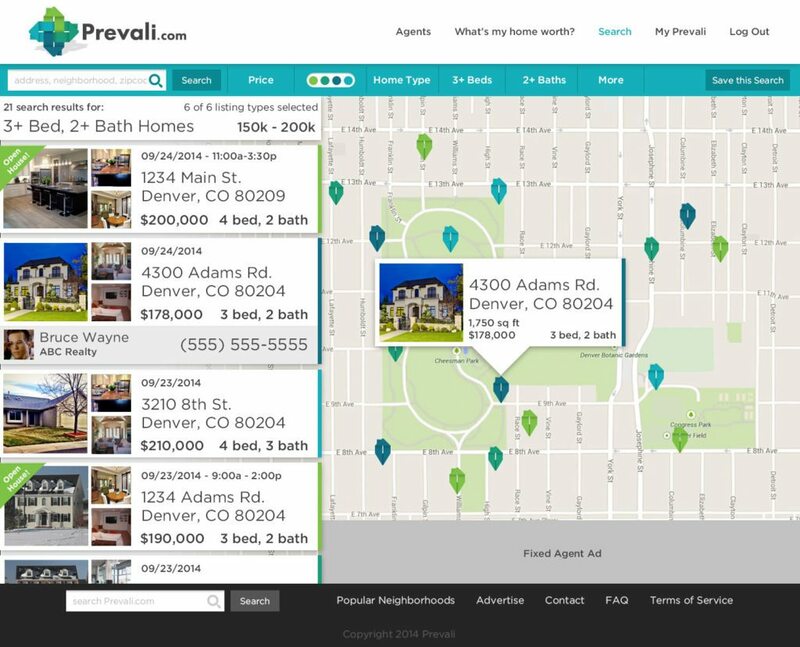 Denver-based Prevali will capture listings “upstream” of MLSs and other search platforms, and theoretically make it easier for real estate agents to connect with buyers outside the MLS, said E.J. Footer, who co-founded the national portal with Jenny Sharpe. The platform will also sell leads to agents — sometimes in exchange for referral fees — and serve up a slew of innovative features designed to meet the needs of certain buyers, sellers and agents. Prevali plans to launch a beta version of the platform in May. Whether the platform will fly with MLSs and appeal to real estate agents remains to be seen. On Friday, REcolorado, the largest MLS in Colorado, told Inman that no one was available to comment on Prevali. Zillow’s database of “coming soon” listings and startup Rebls are among portals that provide exposure for properties that aren’t listed on the MLS. Homecanvasr charges agents for access to a database of off-market homes. Real estate agents also use internal communication platforms like Yapmo to selectively market listings to other agents at their brokerage in the hope of keeping deals in house. But Facebook is probably the most popular channel for dangling properties in front of buyers off the MLS. Prevali’s plan is to wrangle together all the listings that have traditionally surfaced on these platforms. Buyers will visit the portal to get a first look at properties that are for sale or may never surface anywhere else, and sellers and agents will have a public-facing platform to market properties off the MLS. Screenshot showing Prevali listing search page. You might be scratching your head. Does a platform designed to publicize listings that agents prefer not to publicize (by not listing them in the MLS) make sense? Prevali is also catering to agents who don’t want to publicize listings — either on the MLS or anywhere else — by letting them choose to market listings exclusively to other agents in a private agent-only database tucked into the platform. Critics may contend that Prevali adversely impacts sellers. Homes marketed off the MLS, some say, may not fetch market value because they aren’t exposed to the full universe of buyers. But Footer, Prevali’s co-founder, maintains that if “you run the hard numbers you can prove that there’s no real advantage” to listing a home on today’s dominant listing portals. Many sellers have a target price they want to sell for, so if Prevali helps them snag it, everyone wins, Footer added. Footer also echoed an argument made by Zillow in promoting its “coming soon” listings: that Prevali co-opts “pocket listings,” a phrase that refers to listings held off the MLS, by shining a light on them for more prospective buyers. Zillow has argued that, by bringing pocket listings out of the shadows, “coming soon” could reduce the likelihood that pocket listings will incubate dual-agency transactions, in which the agent represents both the buyer and the seller. Critics say that the reduced exposure a pocket listing receives may result in a lower sale price. Like Zillow’s “coming soon” listings, Prevali also might be seen as a threat to the MLS since it could strengthen a market “upstream” of the MLS. Supplement or threat to MLS? Footer casts Prevali as a supplement to the MLS. It’s a place where listings eventually headed for the MLS can live in harmony with listings that would never have made it there at all, he says. Sharpe later added that Prevali believes that the “vast majority” of listings should be posted in the MLS. Prevali caters to those rare cases where marketing a home off the MLS may better suit the needs of a seller, such as in cases where listings are associated with a “high-profile individual,” divorce, financial difficulty or an any seller who places unusual value on privacy, she said. Yet Prevali is also going after “coming soon” listings — listings whose owners and agents plan to eventually list on the MLS — not just listings never intended for the MLS. That means Prevali could make it easier for properties that might have eventually been listed on the MLS sell before they get there. Prevali will also offer a batch of innovative features for real estate agents and consumers. The platform’s ad product lets agents pay flat rates to appear on the search results pages for a ZIP code, and receive the the contact information of people who click on the ads. Prevali sells advertising to only one agent for every ZIP code, so that the agent “owns” a ZIP code and doesn’t need to compete with other agents. Also in contrast to agent ads on some other listing portals, agent ads on Prevali do not appear on listing pages. Prevali also sells some leads — such as to users who request a home valuation or seek contact with a buyer’s agent in a ZIP code that Prevali hasn’t sold advertising to yet — to agents for a 25 percent referral fee. The company may get a broker’s license exclusively for the purpose of referring those leads to real estate agents. But for now, Prevali is using licensed real estate agents “involved” in Prevali to distribute the referrals, Sharpe said. Prevali also will provide a database where buyers and agents can post “property-wanted ads” to attract potential sellers (a feature similar to Zillow’s “Make Me Move”), and let brokers privately market broker-only open houses to each other. In addition, it’ll let buyers “check-in” to open houses by clicking their listings on Prevali, search properties based on special characteristics, and request property valuations from real estate agents.